The two years that have passed since Hurricane Sandy crashed into the New Jersey shoreline have not been enough time for scientists and researchers to make much headway on the hows and whys of the Northeast’s epic storm. But that’s not because they aren’t trying. 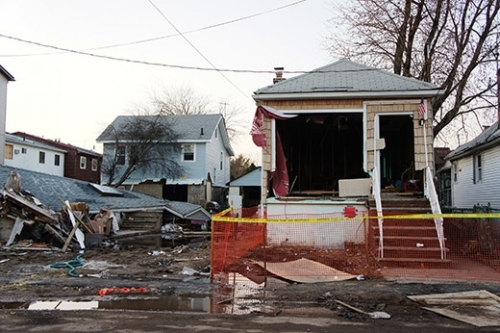 Damage on Staten Island in the immediate aftermath of Sandy. In fact, Sandy has spurred an unprecedented amount of research, attempting to tackle the questions about what role climate change might have played in producing or worsening the storm, how global warming might influence similar storms in the future, and why the storm caused so much damage — $19 billion in the New York City area alone. “It’ll be one of the most studied storms,” said Gary Lackmann, an atmospheric scientist at North Carolina State University who has looked into the role warming might have played in guiding Sandy’s track and intensity. Here, Climate Central takes a look at some of those research avenues exploring the role climate change played in Sandy and how the so-called superstorm impacted our evaluation of current and future coastal risks. The clearest connection between climate change and Sandy’s impacts is sea level rise. Warming oceans and melting land ice have contributed in large part to the nearly 12 inches of sea level rise in the New York area over the past 100 years, a rate faster than the global average of about 8 inches. Sea level rise is contributing to coastal erosion in some places such as the Jersey Shore, but Philip Orton, an oceanographer at the Stevens Institute for Technology in Hoboken, N.J., said that how it interacted with storm surge — the wall of water that hurricanes and other storms push ashore — is what helped drive much of Sandy’s damage. And the future 1-2 punch of storm surge and sea level rise could further reshape the physical and social landscape around New York and New Jersey. “Sea level rise is very uncertain so that’s part of the problem for long-term planning,” Orton said. Of course there’s no uncertainty whether it’s going to happen, it’s just a question of how high seas will go. The New York City Panel on Climate Change report released last year shows that by the 2050s, mid-range sea level rise estimates could be from 11-24 inches in the region. A view of downtown Manhattan. “The answer is definitely, ‘Yes,’” when it comes to questions of whether future sea level rise would increase the risk of Sandy-like flooding, said Adam Sobel, a hurricane modeler at Columbia University’s Lamont-Doherty Earth Observatory. That raises the question of how to adapt to those increasing risks, whether it be building sea walls or reinforcing natural defenses or planning a retreat from the sea. Beyond the height of sea walls is also the question of what the future has in store for the city’s outer neighborhoods. Raising neighborhoods and adding dunes and berms offer protection in the present but rising seas could eventually claw away at those gains. “We know that there’s already many feet of sea level rise baked in because of the heat and carbon dioxide in atmosphere. It’s going to be there, it’s not going to disappear,” Orton said. The role of warming in other aspects of Sandy’s landfall and lifecycle, including the unusual track it took and the strength it achieved are much harder to pin down. Inspired by that unprecedented path, Lackmann looked at how warming might have influenced it and Sandy’s intensity. Using computer simulations to mimic warming and greenhouse gas levels before 1900 and after 2100, he found that the amount of warming to date only slightly strengthened Sandy and caused it to have a more northerly landfall. “The past to current just didn’t change things as much as maybe would be expected,” he told Climate Central. But the future Sandy was considerably stronger and made landfall even further north, along Long Island. The study was what Lackmann called “a thermodynamic experiment,” looking to see what role warming temperatures and the associated increase of water vapor in the atmosphere may have played by a process known as condensational heating (or the heat released when water vapor condenses in the atmosphere). The experiments kept the atmospheric situation that guided Sandy (with a low-pressure area over the U.S. and a high pressure dome over Greenland). The results of the study were detailed online recently in the Bulletin of the American Meteorological Society. In principle, a more holistic look at the role warming played in Sandy could be done in a similar way — as it has been for other extreme events — running computer model simulations with and without the warming induced by greenhouse gases, but because Sandy was such a rare event, the amount of computer time and expense involved are prohibitive for the time being, Sobel said. “I think that if someone really wanted to do it now, with a storm like Sandy, which the models can resolve pretty well,” they could, he told Climate Central, but for the places that possess such models, it would mean dropping all other work. And being able to find the signal of warming in such an effort would depend on how strong the warming effect was — a large, robust effect would show up with fewer model runs, but a small effect would take much longer to parse out. Overall, though, the lack of studies showing a clear role from warming in Sandy “doesn’t mean that there is no climate change role, it just means that the science isn’t there,” Sobel said. Adding to the difficulty of evaluating the role of warming in a storm like Sandy was the transition it made from a tropical to an extratropical cyclone, and the way it merged with low-pressure systems to become a “hybrid” storm. There is much more research suggesting that tropical cyclones will become more intense, but the research into extratropical cyclones hasn’t really been looked at from this angle, Sobel said. “We do not have anywhere near the number of historical records of such events as we do pure tropical hurricanes, and our understanding of hybrids is also not at the same level as our understanding of hurricanes,” said MIT’s Kerry Emanuel, one of the main scientists who has researched the link between tropical cyclones and climate change. The tracks that hurricane Sandy might have taken in the past under less warming (green), today under current warming (blue) and with future warming (red), compared to the National Hurricane Center's estimation of Sandy's actual track. The strange track taken by Sandy, moving northward along the east coast of the U.S. before making a sharp turn westward and slamming into New Jersey, was one of the aspects of the storm that generated particular research interest. Sobel, along with colleague Timothy Hall of NASA’s Goddard Institute for Space Studies, used computer models to simulate millions of “synthetic” hurricanes, and worked out that Sandy’s track was a 1-in-700-year event. The unusual track also piqued the interest of another scientist, Jennifer Francis of Rutgers University. “There were so many interesting things about Sandy that got my antennae quivering,” she said in an email. What caused Sandy to take its left-hand turn into the U.S. was what is known as a blocking pattern, where kinks in the jet stream — which normally guides storms from west to east — get stuck. In this case, a high-pressure ridge in the jet became stuck over Greenland, which forced Sandy to the west. Francis had just published work suggesting that the amplified warming of the Arctic and associated sea ice melt there was forcing the jet stream into the wavier, blocking patterns. As the Arctic warms, she and her colleagues argue, the temperature difference between the Arctic and the tropics is reduced, and because that temperature difference is what fuels the jet stream, the Arctic warming leads the jet stream to slow and get stuck. “We were just coming off of a record-smashing low sea-ice year in 2012,” Francis said. “The block that played such a key role in Sandy's ‘weirdness’ seemed like an amazing coincidence.” And an amazing research opportunity that Francis and some colleagues immediately began to explore. Other researchers aren’t yet sold on this link between Arctic amplification and blocking events, as climate models don’t seem to clearly produce it. But whether the models are wrong or if the link doesn’t pan out is something more research will surely look into. Parsing the underlying climate factors that drove Sandy to its fateful encounter with the Northeast is important, but ultimately how that knowledge is used to prepare for the next storm is what really matters. Sandy damage in the Rockaways neighborhood of Brooklyn. Titley now runs the Center for Solutions to Weather and Climate Risk at Penn State, a relatively new research endeavor, which is focused on solutions and opportunities offered by weather and climate predictions and data to planners across a variety of sectors. Sandy’s rampage coincided with what many see as the rise of big data, with streams of information being returned from weather buoys, cell phones, security cameras, population surveys and other sensors that permeate our daily lives. That wealth of data is available to scientists and decision makers to pinpoint where failures in responding to the storm broke down and consequently need to be shored up. Some of the findings reinforce longstanding knowledge, such as the fact that poor and underserved communities were disproportionately affected by the storm. But data on those and other impacts coupled with climate projections can help pinpoint how to best spend some of the billions of money available for rebuilding and strengthening the city’s response to future storms. “If I had $50 million and I know what that buys me, then I need to understand what the best use is,” Titley said.